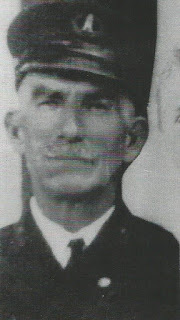 Wesley Austin (1864-1941) was the keeper of the Ocracoke lighthouse from 1912 -1929. Keeper Austin kept a daily logbook which Ellen Marie Fulcher Cloud copied from microfilm stored at the National Archives in Washington, D.C. In her book Ocracoke Lighthouse Cloud includes Capt. Austin's entry for Aug. 23, 1925 --"Four masted schooner Victoria S. stranded on Ocracoke Roads about 1 am -- in part from Georgetown SC to New York loaded -- Pine lumber." According to my father, he was on beach patrol Aug. 22-23 with his father, a Coast Guardsman, when they saw a schooner making peculiar maneuvers offshore. My grandfather speculated that the captain was just waiting until nightfall to "run her aground" for the insurance money. Sure enough the "Victoria S" wrecked that night. A "Roads" or "Roadstead" is a partly sheltered body of water near the shore where ships may safely ride at anchor. Our latest Ocracoke Newsletter is about earthquakes that have affected Ocracoke and the Outer Banks. 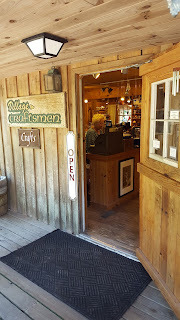 You can read the newsletter here: http://www.villagecraftsmen.com/news092116.htm. 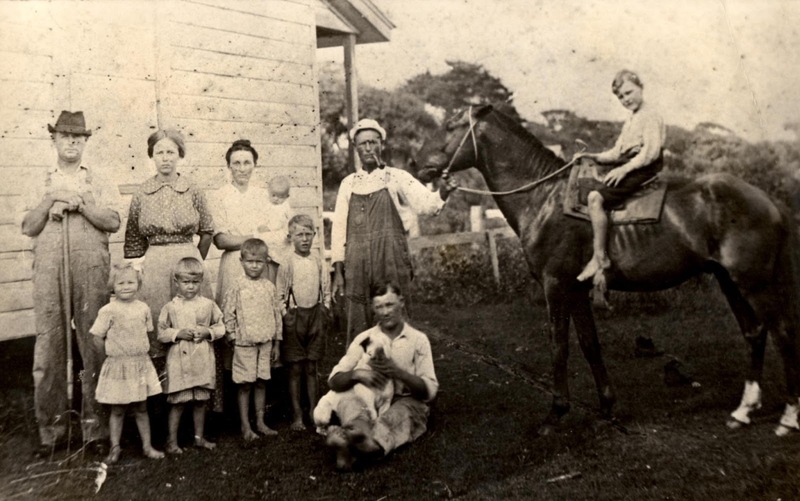 Ocracokers have long been recognized as clever and resourceful.The tale is told that during the early days of the Civil War, when Union troops invaded Portsmouth and Ocracoke Islands, most of the residents fled. Word got around to those who stayed behind that the federal soldiers were convinced that many islanders had gold stashed away...and they were searching for it. The remaining islanders dug a deep pit and buried their gold in the pit. 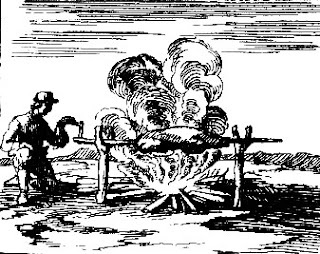 Then they piled log wood in the pit and set it on fire. When enemy soldiers came by they saw a large ox roasting on a spit over the fire. The Ocracokers invited the soldiers to join them for the feast. The soldiers never knew how close they were to the gold. Last year, in an article in the San Francisco Chronical about maritime pioneers, Nancy Wagner, who had recently retired, was recognized as "the first female ship pilot in the United States." In the past I have written about pilots who steered sailing vessels over the bar at Ocracoke Inlet. There was at least one woman pilot in the early days. According to an article in the The Observer, Raleigh, June 22, 1879, John Gray Blount [1752-1833], in a diary, stated that when he was a very young man, an old man on Ocracoke told him that the first vessel ever piloted over Ocracoke bar was brought in by a woman name Patsey Caraway. We don't know anything more about Patsey Caraway, Blount's report is admittedly anecdotal, the United States of America did not yet exist when Caraway reportedly acted as a pilot, and we have no idea if she was officially licensed. Nevertheless, there is reason for a bit of island pride. 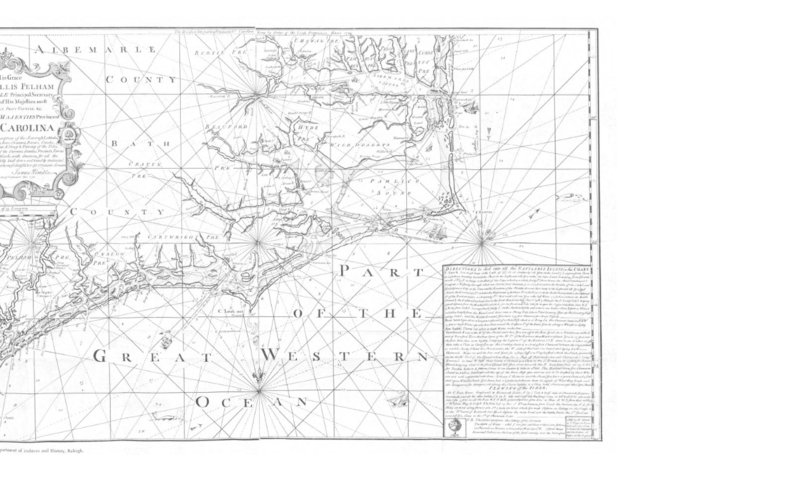 It certainly looks like Ocracoke's Patsey Caraway cracked the "ship's pilot glass ceiling" more than 250 years ago! Congratulations, Patsey! There’s lots going on Halloween Weekend 2016 on Ocracoke Island, N.C.
• Freakin’ Firkin Keg Tapping (old-fashioned beer barrel) at 3 p.m. at Zillie’s Island Pantry. • Ocracoke School Carnival in the gym starting at 3:30 p.m. with a costume parade for kids followed by carnival games, bouncy houses, food, “cake walk,” a movie in the school Commons Room for kids; “Quiz-O” for adults. Lasts until about 9 p.m.
• A “spook walk” in the front yard of the Magic Bean Coffee Bazaar, School Road. • Coyote Den: Martin Garrish & Friends "Ocracoke Memories." 7:30 p.m.
• Pirate Make-and-Take craft at the OPS Museum, 2-3pm. Fun for all ages! $5 donation appreciated. • Ocracoke Bar & Grille: The Motley Tones, (pirate minstrels), 4 to 6 p.m.
• Several activities in Community Square from 4 to 6 p.m.: --Trick-or-treating at the shops in the Square --Rumgagger: stories and songs with Fiddler Dave and Capt. Rob on the dock of the Wilma Lee. --Chicken dinner and bake sale by the Ocracoke School fourth and fifth-grade classes to raise money for their school trip --The drawing the raffle winner for a custom-designed golf cart (for the benefit of Ocracoke Youth Center) will be held at 5 p.m. -- Ocracoke Ghost Stories with Amy Howard on the porch of the Coyote Den, 5 p.m. --And more! • Gaffer’s Sports Pub will host their annual Halloween party with live music and a costume contest with a “Famous Horror Movie Monster” theme, and 80s cover band Raygun Ruby will play at the Howard’s Pub for their costume party. Both Halloween celebrations are on Saturday night where revelers walk back and forth to check out each other’s costumes at each venue. Pirates and wenches are welcome. 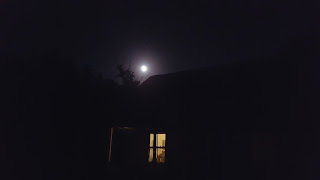 • Ocracoke Oyster Co.: Martin Garrish, 6:30 p.m.
“All Alone and Lonely: An Evening of Haunting Appalachian Folklore,” Written and performed by Jennifer Starr Coyote Den, Community Square. 8 to 9:15 p.m. $10/kids $5 (may be too scary for children under 10) This single act, musical play features stories of love lost, love found, restless spirits, deception, murder, and one incredibly roguish "werefox." 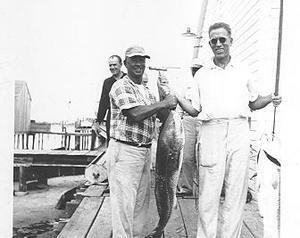 According to a 1938 article in the Beaufort News (Beaufort, NC), "The first Gulf Stream fish (dolphin and amberjack) ever caught with rod and reel off North Carolina were landed off Ocracoke Island. That was back in 1910, and the anglers making the initial catches were Frank L. Fuller, of New York City, and Tom Eaton, of Winston-Salem." "…quite probably the first offshore fishing trip from the Hatteras area was made in the early 1920s by a man named…Thomas Spurgeon Eaton,…the son of a Reynolds tobacco Company executive. He was also an avid fisherman and a lover of the Outer Banks of North Carolina…. [As Carlson notes, even in the 1930s 'off-shore' trips were rare in large part because of 'a healthy respect for the fickle weather at Cape Hatteras']. Tom Eaton talked Captain Bill Gaskill of Ocracoke Island [and proprietor of the Pamlico Inn] into taking him all the way out to the Gulf Stream to fish. A skeptical Bill Gaskill deferred to his son, Thurston, to skipper the boat. They went out Ocracoke Inlet and fished the Gulf Stream, but got lost on the way in [this was long before fishing boats were equipped with electronic navigation aids such as depth finders, radios and GPS] and finally came in through Hatteras Inlet, having caught six huge dolphin. This was probably the first real blue-water charter trip off Cape Hatteras." To see more photos of the Pamlico Inn and Thurston Gaskill, click here. 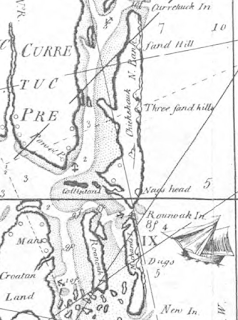 I have discovered more than fifty different spellings for Ocracoke in various historical documents and maps. The name is clearly of Native American origin, probably from "Wingandacon" which became "Wococon" or "Wokokon" on early maps. Some researchers believe the first Europeans believed the Indians were telling them the name of the place, when they were actually saying, "You wear good clothes." Kitty Hawk is another Outer Banks village with an interesting name. Many legends have developed about where the name came from. Dragonflies, which are common on the Banks, are often called skeeter hawks, and some have suggested this as the origin of the name. Huak (probably an imitation of the sound made by a goose) is also an Indian word. It refers to this common waterfowl in eastern North Carolina. Could this be where Kitty Hawk derives its name? 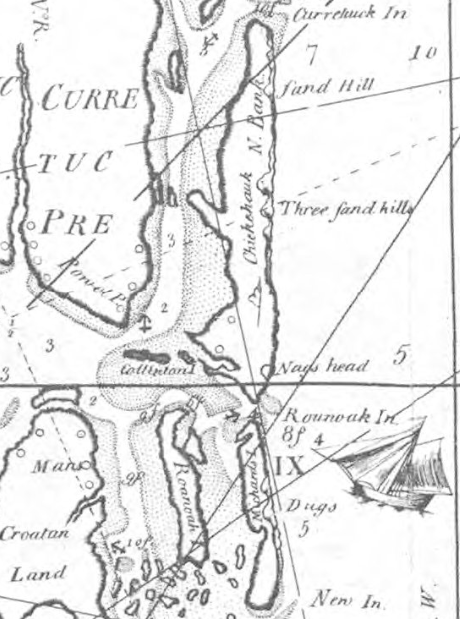 The detail below shows "Chickehauk" just to the left of "Three sand hills." We normally publish a new Ocracoke Newsletter each month. However, because Hurricane Matthew monopolized our attention for the last several weeks, we have decided to continue to promote our September Newsletter about earthquakes that have affected Ocracoke and the Outer Banks. 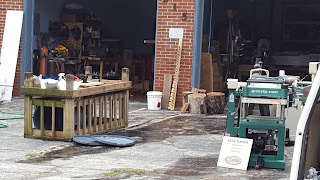 In case you missed this Newsletter, you can read it here: http://www.villagecraftsmen.com/news092116.htm. Portsmouth Village was not too badly affected. There was some tide in several buildings -- the Visitors Center, the Visitors Center shed, the Post Office, the School, the Life-Saving Station, and the stable. Everything had been put up so there was not much damage. However, quite a few large cedars were blown over. The Methodist church and the Haulover dock were unscathed. Henry Pigott's house was not flooded. Of course, it could have been much worse. 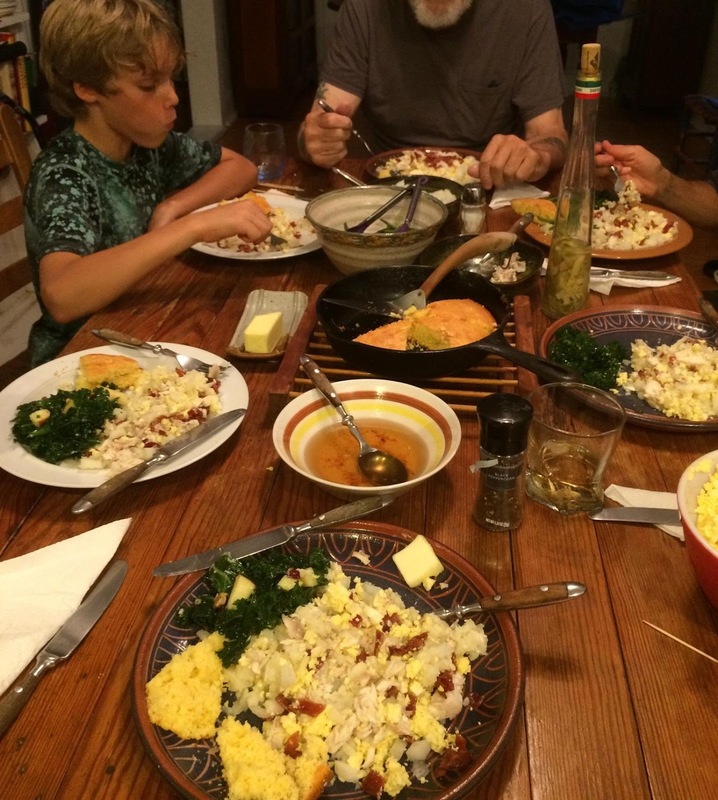 One of the island's most cherished dinners is Old Drum, Ocracoke style. We can no longer get old drum, but David purchased some younger drum (channel bass) at the fish house before the storm. We made a great meal out of it that very day! The "ceremony:" Boil drum in lightly salted water until it flakes. In another pot, boil about 2 medium potatoes per person. Hard boil 2 eggs per person. Dice a good size bowl of onions. Dice and fry-out (render) salt pork until brown and crunchy. Assemble at the table, fixing each plate individually. 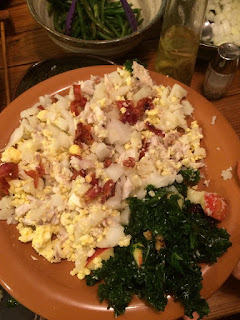 Mash potatoes with fork, flake drum in with potatoes and sprinkle generously with diced onion. Add salt, pepper and chop up the hard boiled egg in the mixture, adding a good helping of cracklings and grease. Sprinkle with vinegar if desired. Enjoy! Be sure to mix enough on the first plate. Somehow the second plateful never tastes as good as the first. Never plan anything for a couple of hours after you eat this. Just slide under the table and rest a spell. Don't forget the baked cornbread and lots of butter. I wonder how many readers remember my father, Lawton Howard (1911-2002). He had an impish sense of humor that endeared him to everyone he met. If you don't remember Lawton you can read about him here: http://www.villagecraftsmen.com/news011805.htm. 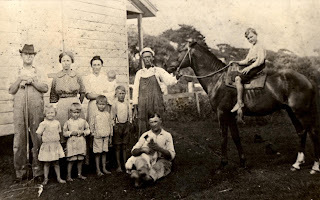 This following photo shows his family in Spring, 1912. Lawton is the baby in his mother's arms. The photo was taken by the corner of my house on Lawton Lane. Back row: Wheeler Howard (my father's uncle), Agatha Howard (my father's oldest sister), Aliph Howard (my father's mother), Lawton Howard, Homer Howard (my father's father). Front row: Cordelia Howard (my father's sister), Lawrence Simpson (my father's 2nd cousin), Edward Simpson (my father's second cousin), Evans Howard (my father's brother). Sitting, in front with dog: Marvin Howard (my father's brother). On horse: James Enoch Howard (my father's brother). 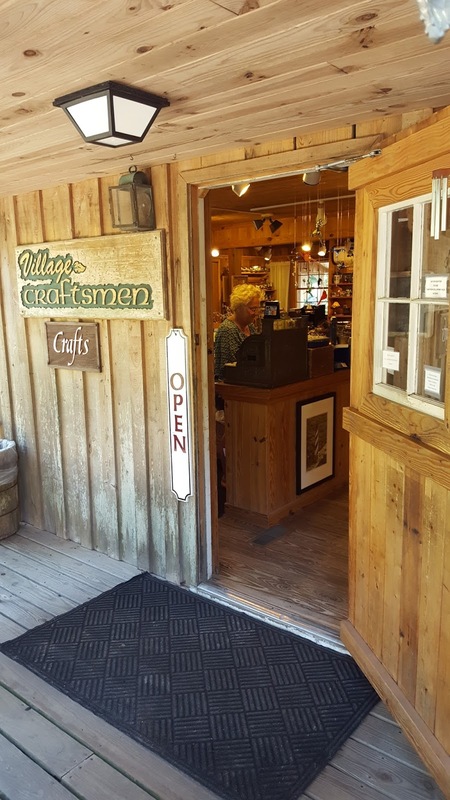 Village Craftsmen has re-opened after Hurricane Matthew. Take a stroll down Howard Street (almost no damage to the live oaks and cedars along the lane), and stop by to say hello. We have a gallery full of quality American-made handcrafts. 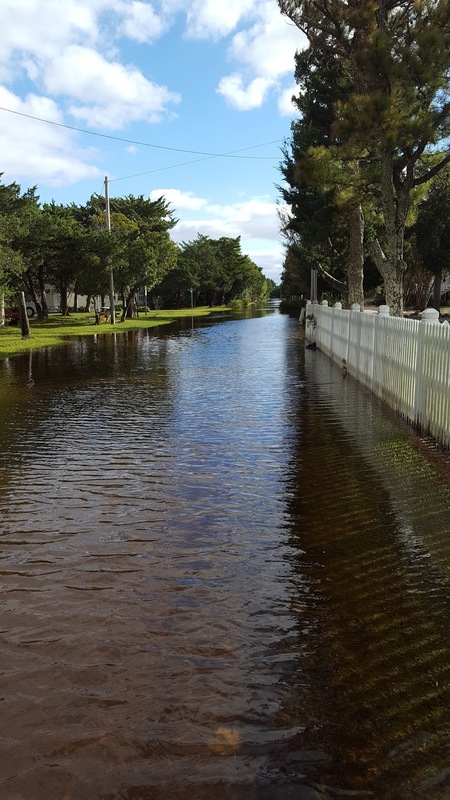 Although Hurricane Matthew downed several trees and brought tides higher than most islanders could remember, and several homes had significant floodwater damage, by and large Ocracoke was spared widespread devastation. 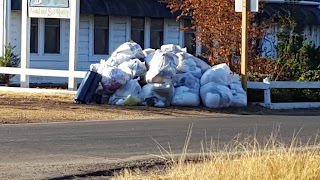 For the past week we have been cleaning up debris from yards and emptying outbuildings that were flooded. Hyde County has hired a contractor who will be coming to the island, starting this Wednesday, to haul away water-damaged items that have been placed alongside the roads. Piles of debris may not be very attractive, but they will soon be gone. The island is drying out, and the weather has been superb...bright, sunny skies, temperatures in the mid-70s, and low humidity. As always, Ocracokers have weathered a serious storm by working together as a community, neighbors helping neighbors. We are looking forward to another beautiful fall and more stellar weather. We expect to see visitors returning to the island later today. The chairman of the Hyde County Board of Commissioners has issued a proclamation for the Termination of the Mandatory Visitor Evacuation Order Issued for Ocracoke Island, effective 5 a.m. today, October 17, 2016 (http://www.hydecountync.gov/doc03291620161016162957.pdf#page=1&zoom=auto,798,711). Islanders have been working hard on clean-up after Hurricane Matthew. Welcome back to Ocracoke Island. The weather is terrific! The Ocracoke Deputy Control Group (ODCG) met today and unanimously voted to recommend lifting the Ocracoke visitor restriction and mandatory evacuation order. The recommendation submitted by the ODCG will require a vote by the Hyde County Board of Commissioners and if approved, a proclamation will be signed to allow visitors entry on Monday, October 17, 2016, at 5:00 AM. Visitors, returning on Monday, need to be mindful of the ongoing recovery efforts and exercise caution before and after the debris removal operations begin on Wednesday, October 19, 2016. Heavy machinery will be working in and around the village next week as they remove tremendous amounts of storm debris. On October 10, 2016, President Obama issued a major disaster declaration for the State of North Carolina triggering the release of Federal funds to help individuals and communities recover from Hurricane Matthew that began on October 4, 2016, and continuing. Hyde County has received a FEMA Individual Assistance (IA) Declaration which allows homeowners, renters, and businesses to apply for vital short-term and long-term recovery assistance. Residents can apply at www.disasterassistance.gov, 800-621-3362 or (TTY) 800-462-7585. Applicants who use 711 or Video Relay Service may also call 800-621-3362. The toll-free numbers are open 7 a.m. to 11 p.m., seven days a week, and multilingual operators are available. Disaster Recovery Centers also will be opening in flood-impacted communities during the next several weeks for those who would like to talk with someone in person. The United Methodist Committee on Relief (UMCOR) case intake center at the Ocracoke Community Center, 999 Irvin Garrish Highway, is now closed. 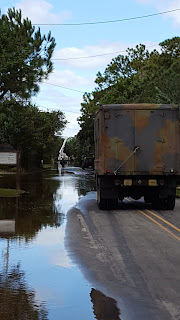 Based upon the needs assessments completed, which totaled twenty-eight (28), UMCOR volunteers will be establishing teams and a base of operations on Ocracoke Island. The UMCOR Coordinator reported that they are hoping to begin work within the next couple of weeks. Hyde County disaster survivors requiring mental health services in the wake of Hurricane Matthew may visit the Trillium Health Resources kiosk located at the Hyde County Government Center, 30 Oyster Creek Road; Swan Quarter, NC 27885, or citizens can call Trillium Health Resources Access to Care at 1-877-685-2415. 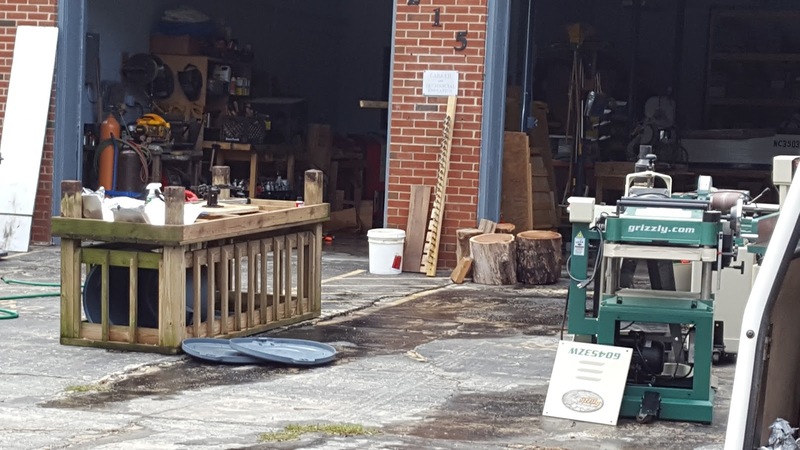 Hyde County's debris removal contractor has completed an initial assessment to determine debris volumes and equipment needs. 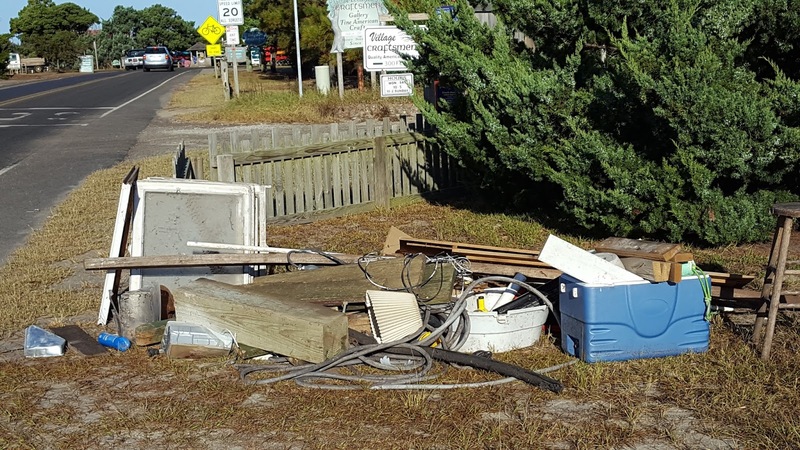 Ocracoke debris removal operations will begin on Wednesday, October 19, 2016 and will continue until volumes have diminished to a locally manageable level. Citizens may transport vegetative storm debris to the designated mainland convenience sites or you can place it on the shoulder of the NCDOT right-of-way as outlined in the diagram provided. The Swan Quarter and Engelhard convenience sites will accept your vegetative storm debris. 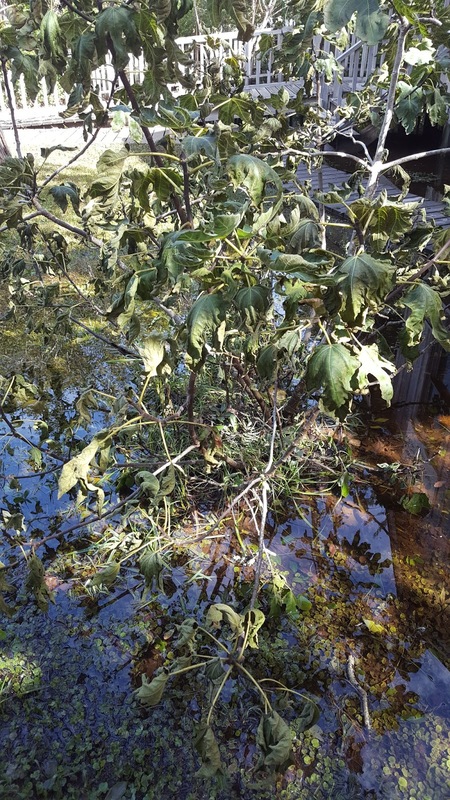 The debris contractor will not collect storm debris on private property. 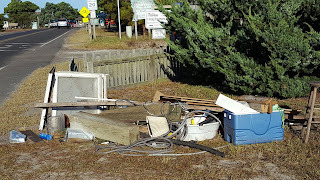 Please do not transport your storm debris to the Temporary Debris Storage Sites (TDSS) on Ocracoke Island or the mainland. Attached, please find instructions detailing how your debris should be separated and placed within the NCDOT right-of-way to be retrieved. Local propane vendors are assessing damages, resetting propane tanks and making repairs. National Park Service is assessing beach access ramps, boat ramps and other infrastructure. Three beach access ramps are available (63, 67, and 70) and the NPS boat ramp is not accessible. Ocracoke Health Center is open and has received medicine and supplies with assistance from the United States Coast Guard. Emergency Medical Service (EMS) ground transports have resumed with the restoration of ferry services to Hatteras. Hyde County Department of Social Services has initiated post-disaster programs to help those who receive food and nutrition services. Please contact Hyde DSS at 252-926-4476 for more information on the Supplemental Nutrition Assistance Program (SNAP). Hyde County has waived all permit fees for reconstruction necessary due to Hurricane Matthew, however permits are still required by the Hyde County Building Inspector's Office. Insurance adjusters and building contractors are being allowed access to Ocracoke if they possess valid credentials. Stores are stocked and prepared to support the returning visitors. Hyde County has received an Individual Assistance (IA) declaration from FEMA. Tideland EMC has completely restored services in Hyde County, however there have been intermittent power outages since restoration of transmission to Ocracoke. NCDOT Ferry Division has restored all services to Ocracoke Island. Please refer to https://twitter.com/ncdot_ferry for the latest ferry information. Through early Monday morning, only residents, non-resident property owners, vendors and essential service personnel are allowed access to the village. Please be prepared to show documentation of the aforementioned statuses to gain access to the island. Individuals wishing to gain access will need to have the appropriate reentry tag or they will be required to produce evidence of property ownership or residency. If traveling throughout North Carolina, please refer to https://www.ncdot.gov/traffictravel/ or https://tims.ncdot.gov/tims/regionsummary.aspx for the latest road closures and routes open to travel. When using the TIMS site, you must select the region or individual counties you are traveling through to obtain specific information regarding your travel plans. Cape Hatteras National Seashore visitor services and facilities on Ocracoke Island, including the visitor center, off-road vehicle permit office, and campground, will re-open on Monday, October 17. The status of beach access ramps will be posted on the Cape Hatteras National Seashore Facebook page here: https://www.facebook.com/CapeHatterasNS/. Water is still standing on many roadways and properties in Hyde County, please do not drive through flood waters or on flooded roads. Water only two feet deep can sweep away most automobiles. Death can occur as a result of careless or unsuspecting motorists who attempt to drive through flooded roads. Turn Around. Don't Drown. If your vehicle is flooded please disconnect the battery cables to prevent a fire from occurring. Please be advised, flood waters may contain sewage and other harmful contaminants. Keep children and pets out of flood waters. The WOVV radio tower was destroyed during Hurricane Matthew and a temporary antenna is providing limited coverage within the village. Citizens can tune in and obtain the most current Ocracoke news by live streaming their programs at www.wovv.org. Please maintain awareness and monitor for further updates from Hyde County Public Information. October 14, 2016 @ 2 p.m.
United Methodist Committee on Relief (UMCOR) volunteers have established a case intake center at the Ocracoke Community Center, 999 Irvin Garrish Highway. The hours of operation will be 9:00 AM to 7:00 PM today and 8:00 AM to 12:00 PM on Saturday. A State of Emergency remains in effect for Hyde County and our citizens are still on the road to recovery, however, Hyde County officials anticipate lifting the mandatory evacuation order and entry/re-entry restrictions for Ocracoke visitors on Monday, October 17, 2016. The Ocracoke Deputy Control Group will meet on Saturday, October 15, 2016, to verify that the weather conditions and recovery efforts have provided a conducive and safe environment for returning visitors. 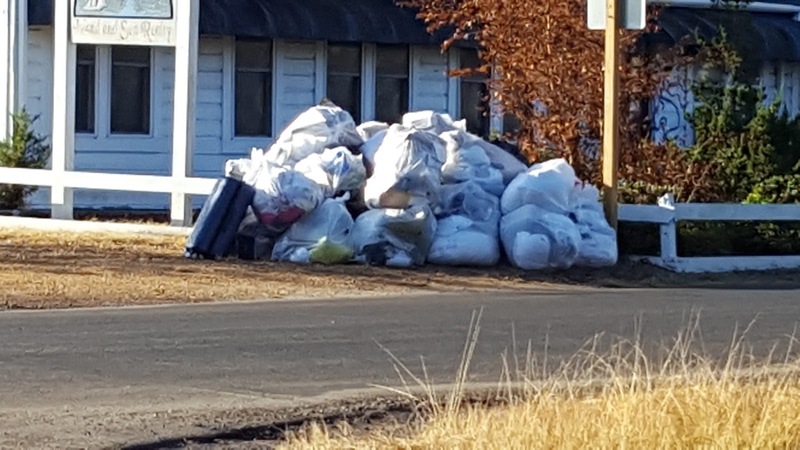 Hyde County's debris removal contractor has completed an initial assessment to determine debris volumes and equipment needs. 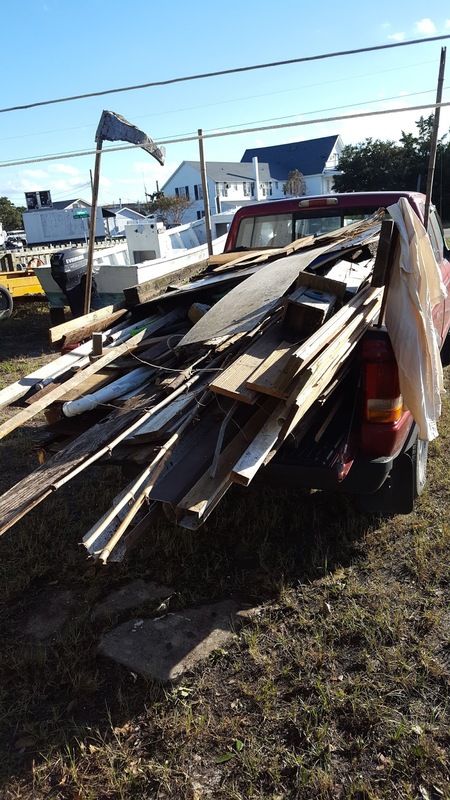 Ocracoke debris removal operations will begin on Wednesday, October 19, 2016 and will continue until volumes have diminished to a locally manageable level. Citizens may transport vegetative storm debris to the designated mainland convenience sites or you can place it on the shoulder of the NCDOT right-of-way as outlined in the diagram provided. The Swan Quarter and Engelhard convenience sites will accept your vegetative storm debris. The debris contractor will not collect storm debris on private property or private roads. Please do not transport your storm debris to the Temporary Debris Storage Sites (TDSS) on Ocracoke Island or the mainland. Attached, please find instructions detailing how your debris should be separated and placed within the NCDOT right-of-way to be retrieved. A delivery of groceries to the island will not occur until Saturday, October 15th at the earliest. The Fairfield Drainage District has declared a drainage emergency due to inundation from the Alligator River which is impacting mitigation structures in the district. Hyde County is coordinating with the Fairfield Drainage District and Mattamuskeet Association to identify and obtain resources for their response and recovery efforts. Although conditions have improved, there has been standing water on NC Hwy 94 between Fairfield and Columbia at the Northwest Fork and these conditions may fluctuate. The NCDOT and County of Hyde are urging commuters to remain alert and aware of the road conditions while traveling in the Northwest Fork area. NCDOT Ferry Division has restored all services to Ocracoke Island. Please refer to https://twitter.com/ncdot_ferry for the latest ferry information. At this time residents, non-resident property owners, vendors and essential service personnel are allowed access to the village. Please be prepared to show documentation of the aforementioned statuses to gain access to the island. Individuals wishing to gain access will need to have the appropriate reentry tag or they will be required to produce evidence of property ownership or residency. The organizers of Ocracoke’s Blackbeard’s Pirate Jamboree are disappointed to announce that this year’s event must be cancelled. 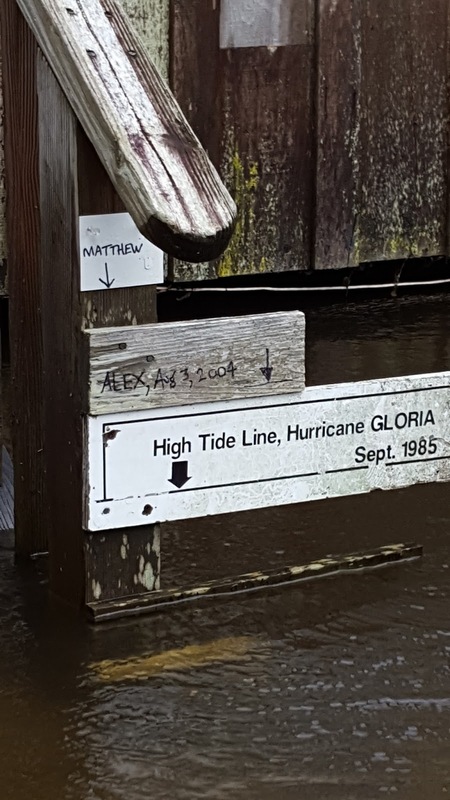 Although Ocracoke fared well in Hurricane Matthew compared to other parts of the state, the island did experience a record high tide during the peak of the storm. Cleanup efforts are underway, but due to significant water damage at some island homes and businesses, and a long evacuation, the organizers missed a critical week of planning. At this point, there’s not enough recovery time to present the amazing piratical event that we’ve all come to expect and enjoy. Arrrgh! The committee has decided to cancel the 2016 Jamboree, and plan for better weather in 2017. Blackbeard’s Pirate Jamboree is an annual event, held the last weekend in October, leading to the 300th anniversary of Blackbeard’s demise in 2018. Join us for the Jamboree October 27-29, 2017 and October 26-28, 2018. October 28-30, 2016 will still be Halloween weekend on an enchanted island that loves to dress up and have a good time. Kick off the festivities on Friday with the Firkin (old-fashioned beer barrel) tapping at Zillie’s Island Pantry. All are welcome to the Ocracoke School Halloween Carnival on Friday afternoon/evening, which is a fun family-friendly event including a kids’ costume parade, bouncy houses, carnival games, food sales, a cake walk, and Quiz-O. On Saturday afternoon, 4-6pm, the Community Square will welcome little beggars for a special Trick-or-Treat around the Square shops. Gaffer’s Sports Pub will host their annual Halloween party with live music and a costume contest with a Famous Horror Movie Monster theme, and everyone’s favorite 80’s cover band, Raygun Ruby, will play at the Howard’s Pub for their costume party. Both Halloween celebrations are on Saturday night – revelers walk back and forth to check out each other’s costumes at each venue. Pirates and wenches are welcome, of course! Mark your calendars for Ocracoke’s other fall/winter events: the first annual Festival Latino de Ocracoke, celebrating Ocracoke’s Latino community with food, music, and dance on November 12th; Thanksgiving weekend with live music, great shopping, and a holiday boat parade; the OPS Holiday Home Tour on December 3rd; and the Working Watermen’s Annual Oyster Roast on December 30th. Ocracoke is especially beautiful in October and November and we encourage visitors to enjoy the “less is more” atmosphere of fall on the sandbar. Fall is a time for great fishing and shelling and strolling at the beach, and, while most businesses remain open through Thanksgiving weekend, even the village offers a quiet refuge from the busy-ness of the mainland. October 13, 2016 @ 6 p.m.
Hyde County's debris removal contractor has completed an initial assessment to determine debris volumes and equipment needs. Ocracoke debris removal operations will begin on Wednesday, October 19, 2016 and will continue until volumes have diminished to a locally manageable level. Citizens may transport vegetative storm debris to the designated mainland convenience sites or you can place it on the shoulder of the NCDOT right-of-way as outlined in the diagram provided. The Swan Quarter and Engelhard convenience sites will accept your vegetative storm debris. The debris contractor will not collect storm debris on private property or private roads. Attached, please find instructions detailing how your debris should be separated and placed within the NCDOT right-of-way to be retrieved. United Methodist Committee on Relief (UMCOR) volunteers are en route to Ocracoke Island, this afternoon, to assess unmet needs in the wake of Hurricane Matthew. The UMCOR caseworkers will establish a case intake center at the Ocracoke Community Center, 999 Irvin Garrish Highway, on Friday, October 14, 2016. The hours of operation will be 9:00 AM to 7:00 PM on Friday and 8:00 AM to 12:00 PM on Saturday. The WOVV radio tower was destroyed during Hurricane Matthew and they are unable to broadcast. Citizens can tune in and obtain the most current Ocracoke news by live streaming their programs at www.wovv.org. National Park Service is assessing beach access ramps, boat ramps and other infrastructure. As of today, three beach access ramps are available (63, 67, and 70) and the NPS boat ramp is not accessible. Hyde County Department of Social Services has initiated post-disaster programs to help those who receive food and nutrition services, once the necessary declarations have been received. Please contact Hyde DSS at 252-926-4476 for more information on the Supplemental Nutrition Assistance Program (SNAP). Hyde County has requested an Individual Assistance declaration. NCDOT Ferry Division has restored all services to Ocracoke Island. The Ferry Division began runs to and from Hatteras yesterday and operations will be restricted to daylight hours only. Please refer to https://twitter.com/ncdot_ferry for the latest ferry information. At this time residents, non-resident property owners, vendors and essential service personnel are allowed access to the village. Please be prepared to show documentation of the aforementioned statuses to gain access to the island. Individuals wishing to gain access will need to have the appropriate reentry tag or they will be required to produce evidence of property ownership or residency. October 12, 2016 @ 3 p.m.
National Park Service is assessing beach access ramps, boat ramps and other infrastructure. The NPS boat ramp is not accessible. Hyde County Department of Social Services will be initiating post-disaster programs to help those who receive food and nutrition services, once the necessary declarations have been received. Please contact Hyde DSS at 252-926-4476 for more information on the Supplemental Nutrition Assistance Program (SNAP). Insurance adjusters are being allowed access to Ocracoke if they possess valid credentials. A delivery of groceries to the island will not occur until Thursday, October 20th at the earliest. Hyde County Health Department and Building Inspector's Office need to visit Ocracoke to assess food and building safety. Hyde County has not yet established a date for releasing the visitor restriction, however it will not be this weekend. We will do so only after all issues regarding health and safety have been addressed. A State of Emergency remains in effect and Ocracoke still has much work to do before lifting the visitor restriction. Hyde County's debris removal contractor will be on island this evening to determine equipment and personnel needs. Attached, please find instructions detailing how your debris should be separated and placed within the NCDOT right-of-way to be retrieved. Please do not transport storm debris to the convenience sites as the facilities have limited capacity for the volumes expected. Most Hyde County convenience sites are now open and operating on normal schedules, except the Fairfield site which remains flooded. The Fairfield Drainage District has declared a drainage emergency due to inundation from the Alligator River which is impacting mitigation structures in the district. Hyde County is coordinating with the Fairfield Drainage District and Mattamuskeet Association to identify and obtain resources for their response and recovery efforts. There is standing water on NC Hwy 94 between Fairfield and Columbia at the Northwest Fork. NCDOT and Hyde County urge commuters to find alternate routes to and from Hyde County. Tideland EMC has almost completely restored services in Hyde County, however there have been intermittent power outages since restoration of transmission to Ocracoke. NCDOT Ferry Division has restored all services to Ocracoke Island. The Ferry Division began runs to and from Hatteras this morning and for today, operations will be restricted to daylight hours only. Please refer to https://twitter.com/ncdot_ferry for the latest ferry information. At this time residents, non-resident property owners, vendors and essential service personnel are allowed access to the village. Please be prepared to show documentation of the aforementioned statuses to gain access to the island. Individuals wishing to gain access will need to have the appropriate reentry tag or they will be required to produce evidence of property ownership or residency. There has been no determination as to when visitors will be allowed access. Water is still standing on many roadways and properties in Hyde County, please do not drive though flood waters or on flooded roads. Water only two feet deep can sweep away most automobiles. Death can occur as a result of careless or unsuspecting motorists who attempt to drive through flooded roads. Turn Around. Don't Drown. If your vehicle is flooded please disconnect the battery cables to prevent a fire from occurring. Much of the standing water has receded, and islanders have been busy with clean-up. 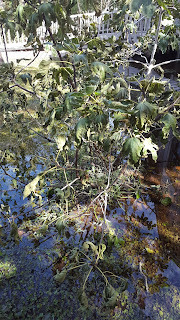 This fig tree beside the Village Craftsmen does not look very happy about the flooding! As of this writing I have not heard any news about when the ferries will be carrying visitors to the island. Check back later to see if we have any updates. October 11, 2016 @ 3 p.m. The National Weather Service has issued a Coastal Flood Advisory for Ocracoke and counties adjacent to the Pamlico Sound for minor sound side flooding through late this evening. Continued large swells will produce dangerous rip currents especially north of Cape Lookout. High water levels across the Pamlico Sound will lead to minor sound side flooding for adjacent land areas. The NCDOT Ferry Division began runs from Swan Quarter and Cedar Island this morning following their regular winter schedule. At this time residents, non-resident property owners, vendors and essential service personnel are allowed access to the village. Please be prepared to show documentation of the aforementioned statuses to gain access to the island. Individuals wishing to gain access will need to have the appropriate re-entry tag or they will be required to produce evidence of property ownership or residency. There has been no determination as to when visitors will be allowed access. The NCDOT Ferry Division reports that it is working conjunctively with the US Army Corp of Engineers and the United States Coast Guard to restore complete service on the Hatteras route and will open that route as soon as possible. Additionally, Dare County law enforcement officers will be enforcing the entry/re-entry priorities and restrictions, established by Hyde County, at their checkpoints on NC Highway 12. Hyde County officials will be issuing a debris removal notice to proceed. Attached, please find instructions detailing how your debris should be separated and placed within the NCDOT right-of-way to be retrieved. Please do not transport storm debris to the convenience sites as the facilities have limited capacity for the volumes expected. In addition, the convenience sites in Swan Quarter and Fairfield are closed today due to flooding and there is substantial flooding on the roadways leading to the Sladesville convenience site. Tideland EMC reports services have been fully restored. Hatteras dropped transmission at 12 noon to replace the broken pole on Hwy 12. Tideland EMC sent a text informing Ocracoke residents that transmission restoration was underway. If traveling throughout North Carolina, please refer to https://www.ncdot.gov/traffictravel/ or https://tims.ncdot.gov/tims/regionsummary.aspx for the latest road closures and routes open to travel. If using the TIMS site, you will have to select the region or individual counties you are traveling through to obtain specific information regarding your travel plans. Please do not drive through flood waters or on flooded roads. Water only two feet deep can sweep away most automobiles. Death can occur as a result of careless or unsuspecting motorists who attempt to drive through flooded roads. Turn Around. Don't Drown. If your vehicle is flooded please disconnect the battery cables to prevent a fire from occurring. Just a public word of thanks to all of the Tideland Electric crew who worked so diligently to restore electric power to the village so quickly after Hurricane Matthew!! It is much appreciated. Here are a few photos I took recently. 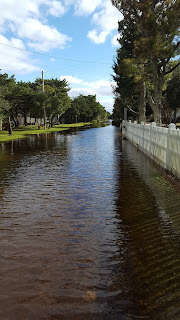 As of late this afternoon there was still a lot of standing water in the village. Although power has been restored, regular ferry service has not yet resumed. Please see out last post for the latest information about ferries. Check back frequently for future Advisories. Matthew was a serious hurricane that brought quite a lot of flooding to Ocracoke. A number of island homes and business had several inches of tide water in lower floors. Quite a few automobiles were also flooded. Damage from wind was generally minimal. However, it will be a while before those affected will fully recover.